Singer-songwriter Tomoe Takizawa has two previous album releases, Watashi, Kona ni Natte (Narisu Compact Disc) and a b c b (Headz). Additionally, Takizawa is an improviser who regularly gives improvisational performances at Ftarri using various instruments and objects as well as voice. This album explores her appealing qualities as an improvisational musician. 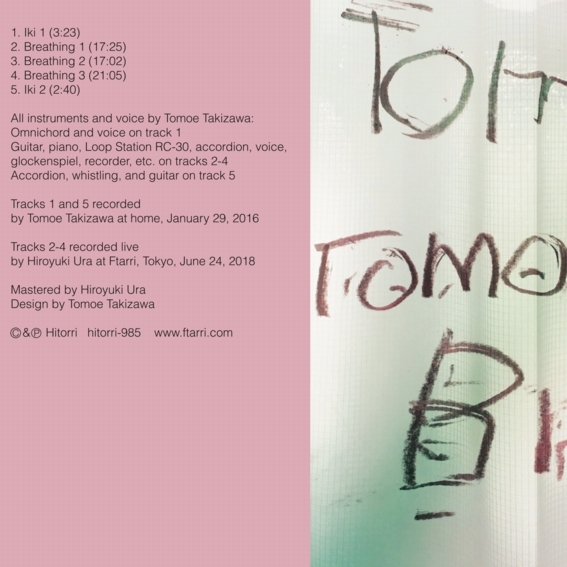 Tracks 1 and 5, short pieces of 2-3 minutes recorded by Takizawa at her home in January 2016, serve as the album's introduction and ending. The main tracks (2-4), each between 17 and 21 minutes, document her live performance at Ftarri in June 2018. On stage Takizawa is surrounded by various instruments and objects among which she walks in a leisurely way, reaching for guitar, piano, accordion and other instruments and objects, producing sounds, and humming. Amid the strangely airy feeling, wrapped in a mysterious and completely tension-free atmosphere, even the question "What's it all about?" becomes irrelevant. This unique and relaxing work makes you feel like losing yourself in daydreams.